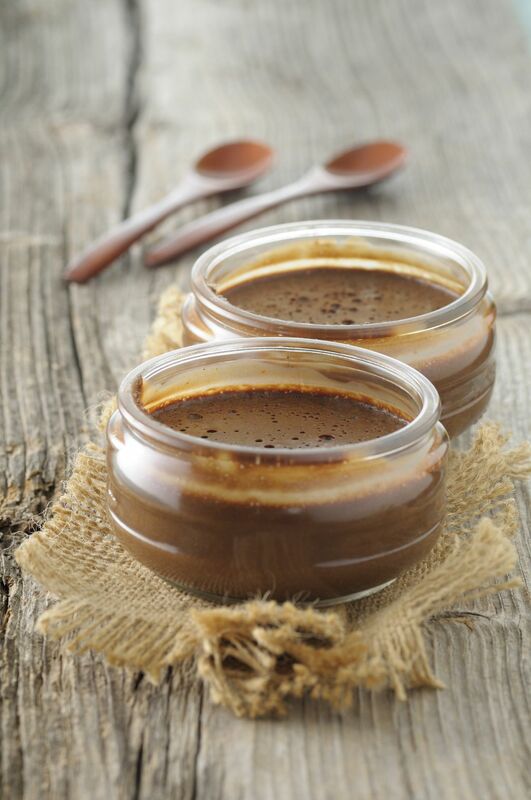 There are several methods for making chocolate mousse, most of which we've tried at least once. This is our favorite. It starts with a rich chocolate egg custard and gets its airy texture from whipped cream. The finished dessert is not very sweet; if you prefer a sweeter mousse, use a chocolate with a lower cacao percentage (60-65 percent) or add the optional liqueur. Heat 3 tablespoons of the cream in a small (1-quart) heavy saucepan just until bubbles start to form around the edge of the pan. Whisk together the egg yolk, sugar, and salt in a small heatproof bowl. Add the hot cream in a slow stream, whisking until combined. Transfer mixture back to the saucepan and cook over low heat, stirring constantly, until it thickens enough to coat the back of a spoon. This can take anywhere from 5 to 10 minutes. Resist the urge to turn the heat up or you'll risk scrambling the egg. Meanwhile, melt chocolate. You can do this in a microwave by heating for 30 seconds at 50 percent power. Remove the bowl and stir the chocolate. Repeat for 30-second intervals, stirring in between, until chocolate is melted—about 90 seconds. If you don't have a microwave, you can melt the chocolate in a small heatproof bowl set over a pan of simmering water, stirring frequently. Let cool slightly. Pour the custard through a fine sieve into the chocolate. Add vanilla (and liqueur, if using) and whisk custard into chocolate until smooth. Let cool. Beat the remaining 1/2 cup of cream in a small bowl using a hand mixer (most stand mixers are too large for this amount of cream) just until stiff peaks begin to form. Fold the cream into the chocolate mixture: Begin by adding a heaping spoonful of the whipped cream into the chocolate custard base. Gently stir the cream in to lighten the mixture. When mixed, add about a third of the remaining whipped cream to the chocolate base. Scrape the spatula through and under the chocolate, and fold that over onto the cream. Turn the bowl 90 degrees and repeat. Keep turning the bowl and folding the two elements into each other until they are well combined. Repeat with about half the remaining whipped cream. The mixture will be lighter and the mixing easier. Repeat with the remaining whipped cream. Cover the mousse with plastic wrap and refrigerate for thirty minutes or more, until mousse has stiffened slightly. Scoop or pipe into two ramekins or glasses. Garnish with berries or chocolate curls, if desired.